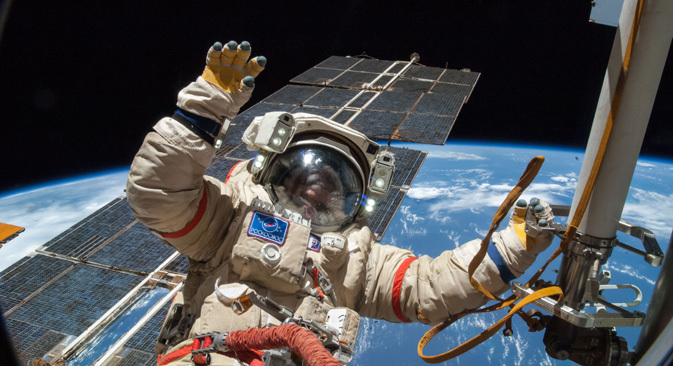 A Russian cosmonaut floats free from politics outside the International Space Station. While bilateral ties between Russia and the U.S. are practically severed on other fronts, away from earth, cooperation continues. When NASA Administrator Charles Bolden took the podium at a space science and policy conference in Washington on April 3 of last year, the future of U.S.-Russian space cooperation didn’t look very bright. One day earlier, an email leaked from the U.S. space agency’s headquarters ordered a suspension of contact with the Russian space agency. As part of the U.S. government’s response to Russia’s incorporation of Crimea, all federal agencies were ordered to halt bilateral work with Moscow. There were, however, a few important exceptions: cooperation would continue in nuclear security and counter-terrorism efforts. NASA, too, received an explicit exception from the order for all work pertaining to the operation of the International Space Station (I.S.S.). I.S.S. is the cornerstone of U.S.-Russia space cooperation. A $150 billion outpost in orbit involving a total of 16 nations, the station is the largest international joint project ever undertaken during peacetime. When Bolden spoke, he struck a note of defiance in the face of an increasingly volatile political situation, criticizing what he saw as an effort by political leaders on both sides to draw science into their terrestrial spat. “[T]he limitations on what our relationship is with Russia are at the government level, and we need to remember that. And so my instruction to my team is that unless I tell you otherwise, don’t stop doing anything that you’re doing,” Bolden said. As relations between Russia and the West hit lows unseen since the Cold War, NASA, Roscosmos and its 14 partner nations were considering the future of the I.S.S. program, which under the original multilateral agreement establishing the program was set to wrap up in 2020. NASA had already received permission from the White House to extend the lifetime of the program until at least 2024, and was waiting on Roscosmos to receive a similar go-ahead from the Russian government. Fuller contests that cooperation never truly suffered over the past two years, despite the super-charged political atmosphere surrounding the project at the government level. “Over the past year and a half, the level of cooperation on I.S.S. has increased even further, resulting in unprecedented joint scientific research,” Fuller said, pointing to an ambitious medical science program launched earlier this year. The experiment involved sending U.S. astronaut Scott Kelly and Russian cosmonaut Mikhail Kornienko to live aboard I.S.S. for a full year, giving scientists on both sides an opportunity to study the effects of long-term spaceflight — such as would be seen on an eventual flight to Mars. Political concerns have not been the only obstacle to achieving this heightened level of cooperation, however. Over the past year, three different resupply missions launched aboard unmanned Russian and American rockets have failed to reach orbit, stretching resources dangerously thin. “But, in spite of those setbacks and through the strengths of the partnership, we have been able to overcome those failures while maintaining the full six-crew presence on I.S.S. and continuing the research,” Fuller said. Pushing through the hardship, Roscosmos and NASA were able to pass an important milestone this month: 15 uninterrupted years of work aboard the space station. This is mainly due to the institutional nature of U.S.-Russia manned space cooperation, which has been built up gradually and periodically since the first joint space mission, the 1975 Apollo-Soyuz test project. The framework for the I.S.S. program was first pioneered during Apollo-Soyuz, and the mechanisms of the partnership are modeled off lessons learned during the Cold War. It is not by chance that NASA officials in Moscow work in the same offices at Roscosmos headquarters and at mission control and that their predecessors did for Apollo-Soyuz. Over time, the two agencies have developed strong ties through recurring and meaningful joint work, rather than the on-again-and-off-again style of bilateral efforts that characterized much of the U.S.-Russia bilateral field two years ago. “I have many colleagues and friends in the Russian space industry, and the different approaches to the same or similar challenges is enlightening and one of the greatest strengths of the I.S.S. partnership,” Fuller said. For the moment, though, the partnership is essentially limited to I.S.S. Though other projects are being discussed, everything happens under the umbrella of this bilateral program, which was created through rigorous negotiations during the administrations of Boris Yeltsin and Bill Clinton. Another part of the problem limiting further cooperation between the two sides lies in capabilities. While NASA has a rigorous budget for its space projects, Roscosmos does not. Science funding in Russia’s space program all but dried up in the 1990s and has not yet been adequately restored. Science funding in Russia’s space program all but dried up in the 1990s and has not yet been adequately restored. However, there is a deep shared interest between the U.S. and Russia in the field of human spaceflight, which may tip cooperation toward manned spaceflight projects. Over time, the two agencies developed strong ties through recurring and meaningful joint work.The mechanisms of the I.S.S. program partnership are modeled off lessons learned during the Cold War.